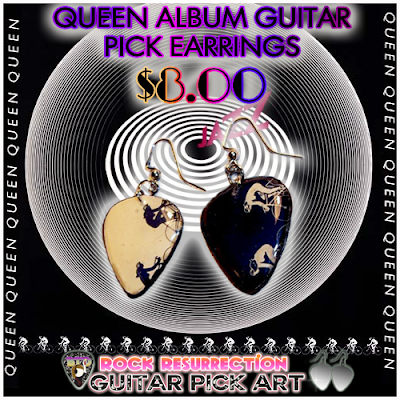 Hand made guitar pick earrings featuring pick cut outs from Queen's album sleeve for "Jazz"! Each one is unique and comes with a cardboard backing cut out from the actual Queen album sleeve. Guitar pick pendants are dipped in several layers of epoxy resin including an application of Mod Podge 3D Magic. Check out the video! They feature naked ladies on bikes in black and white along with geometric shapes! Check out the album before I cut it up. I discovered the album sleeve beat up in a bin at a Goodwill and knew what I could potentially do with it. Instead of it just sitting on the shelf, I strategically cut them out with my Pick Punch and turned them into guitar pick pendants for earrings! This is an awesome way to preserve the album art in a way you can utilize for fashion any day.